Each day for the last two weeks I picked an apple and tasted it. The crop of Red Delicious is abundant and I want to make sure when the majority is harvested they are at the peak of sweet crispness. We’re almost there. The pear harvest was limited to what could be reached. The tree grew well above the house leaving some ripe pears beyond the reach of even my long picking pole. We have enough to eat fresh and some leftover for apple-pear sauce. 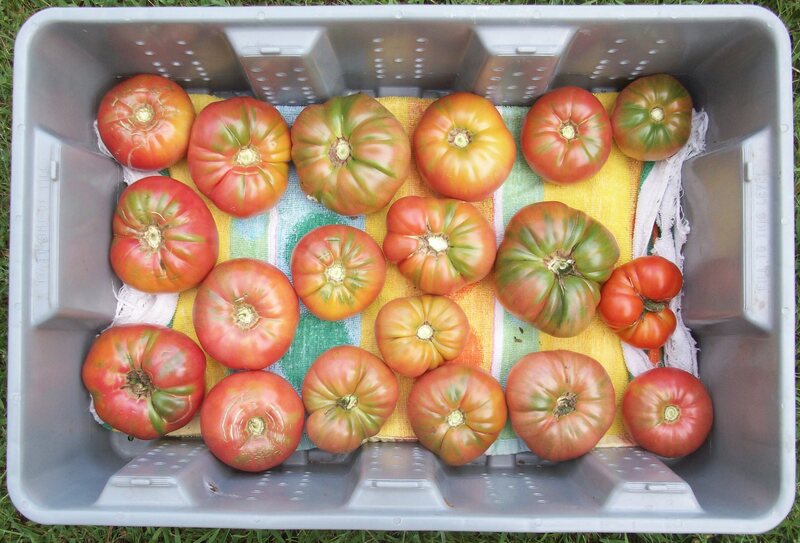 Tomatoes are coming in faster than they can be eaten fresh. The plan is to can smaller ones whole and the slicers diced. There should be plenty of jars to fill the pantry shelves. The by-products of juice and ground bits and pieces will make soup or chili, although there is a limit to how much can be canned and used over the next year. The bell pepper plants are flowering again and celery continues to grow. The main job of deconstructing the garden in preparation for winter will soon begin. But for now, it’s time to pick and preserve as much of the harvest as we can. This entry was posted in Local Food and tagged apples, Garden, local food, tomatoes. Bookmark the permalink.